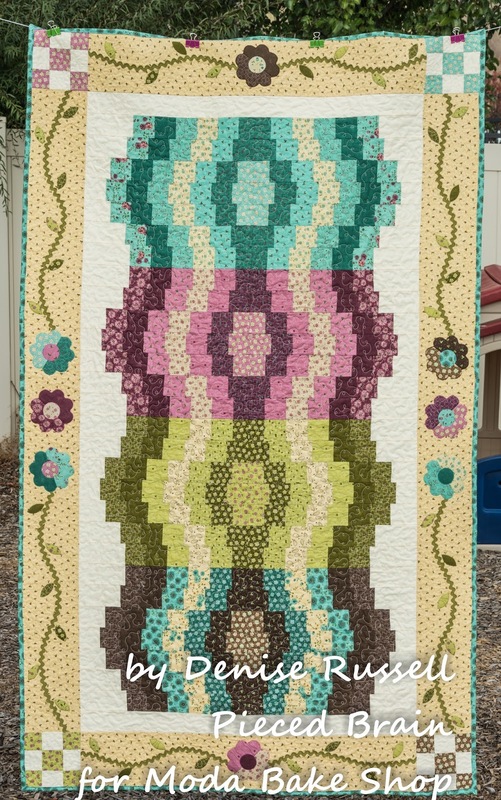 "Dancing Colors" is my latest pattern for Moda Bake Shop, published yesterday on their blog. The pattern was perfect for the Prints Charming line by Sandy Gervais for Moda but will work with your 2-1/2" strips from other projects, too. Jelly rolls save us so much time! I used yardage for the background and border. 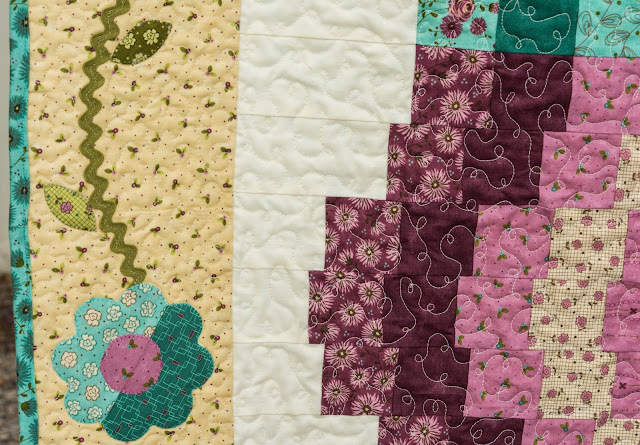 The 9-patch blocks, flowers and leaves were made with leftovers from the stratas. I used 3/4" green ric-rac for the vines and matching Aurifil thread for the applique and piecing. The free motion quilting was 'loopy' as I was waltzing with the colors... I love how this quilt turned out. My daughter-in-law will get it as a birthday gift because she likes teal with browns. If you like the pattern, pop over to Moda Bake Shop and download it. Then, send me a photo of your version of Dancing Colors. I am linking to Crazy Mom Quilts and Confessions of a Fabric Addict on Friday! In the meantime, have a great Monday! Very cool design - looks great! Great design! I love the fun strip shapes combined with the applique.